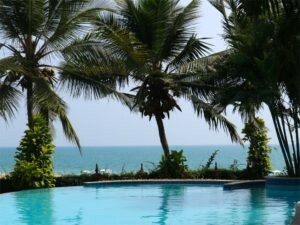 At the Manaltheeram Beach Resort, close to one of the most beautiful beaches in Kerala, you can relax through Ayurvedic treatments and doing nothing on sunbeds under the shade of palm trees by the swimming pool or the sea. It is a special experience to start the day in the morning with gentle yoga exercises and quiet meditation in the garden, while enjoying the magnificent sea views and exotic birdsong. Through Ayurveda treatments, a new body consciousness and inner balance develops and one feels newly born. We often eat together and at some time you can do a backwater tour or visit a temple in the company of the group. 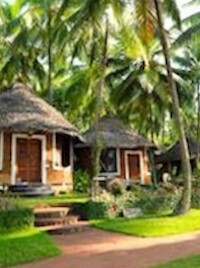 Beautiful garden huts in the shade of the coconut palm trees near the sea. While being pampered with Ayurvedic treatments, you can relax deeply in the lovely exotic nature of India. According to your needs you can sometimes be with yourself and then reconnect and do things together with others. It creates a new body awareness, combined with well-being and lightness, which also strengthens your inner balance and continues for a long time after the treatment. 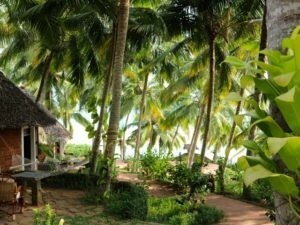 It is a special experience to start the day in the morning with gentle yoga exercises and silent meditation in the garden with stunning sea views and exotic birdsong. The adjoining breakfast buffet in the garden restaurant serves a variety of tropical fruits, freshly squeezed juices and much more. All ingredients are organically grown and freshly processed. Doing nothing after the Ayurvedic treatments will calm you, open your senses and help the healing process. The Ayurvedic treatments take place in the morning and/or afternoon. Every day we receive 2.5 hours of ayurvedic treatments with daily massages with medicated oil or 4-handed oil-flow massages, herbal stamp massages, oil flow on forehead, herb packs and steam baths. The specially prescribed natural medicine, Ayurvedic nutrition and teas, yoga and a lot of rest add to the supportive effect. It harmonizes your life energy and you get into a state of inner peace and balance of body and mind. The pampering programs are personalised to you, depending on the diagnosis of the Ayurvedic doctor who is available every day to answer your questions and if necessary adjusts the treatment plan, depending on how the body responds. 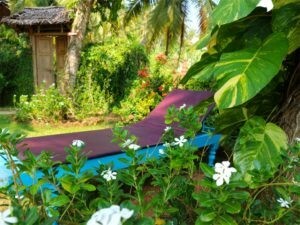 The subsequent rest on the sun loungers in green nature in the shade of the palm trees is part of the relaxation program. It gives you plenty of space to do nothing or to borrow something to read from the comprehensive library. Like this the medicated oil can continue to work and the treatment goes deeper. After the following thorough shower you usually feel like new. Lunch consists of a special Ayurvedic vegetarian diet and if needed, a personalized diet. Depending on which type Vatha, Pitha or Kapha, the doctor has diagnosed us in the introductory talk, you can choose from several dishes and put together yourself what you would like to eat. The Ayurvedic kitchen balances the three basic life energies and brings us into harmony. In a cozy candlelit atmosphere we will all meet again for dinner. Then we can decide spontaneously if we would like to do something or prefer the romantic, nocturnal peace in the resort. The resort offers classic Indian concerts and cultural events in the evenings. Swimmingpool with sea-view in a romantic garden. In the afternoon we can relax in the shade by the pool or spend time with friends. The late afternoon when it is not so hot is suitable for swimming in the sea or walking on the beach (which should be avoided at noon so as not to affect the medicinal effect of the treatment). Catamaran and snorkelling or fishing gear can be rented. It’s an incredible atmosphere here in the early morning when very quiet choral and temple music from the surrounding can be heard mixed with the sound of the sea. This magical place has become a very important part of my life and I will always come back here. Occasionally we will do something together as a group or in small groups, such as a backwater tour with the typical Indian wooden boat, which glides silently through the jungle and gives us the opportunity to observe exotic birds and fantastic nature. A visit to a nearby Hindu temple gives an insight into the colourful variety of Indian religion. To cover all aspects of life, it is dedicated to various divine incarnations. 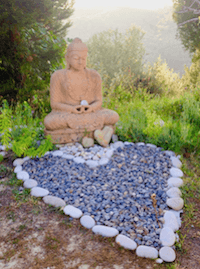 If you want, you can take part in a shared sunset meditation and listen to the amazing sounds of exotic birds and nature while we consciously experience the transition from day to night. As life settles down for the night, it also gets more silent inside us.